Radio frequency components and circuits form the backbone of today's mobile and satellite communications networks. 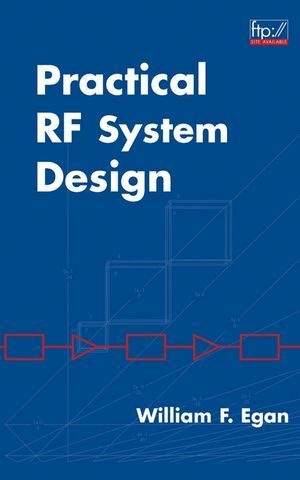 Consequently, both practicing and aspiring industry professionals need to be able to solve ever more complex problems of RF design. An essential resource for today's RF system engineers, the text covers important topics in the areas of system noise and nonlinearity, frequency conversion, and phase noise. Along with a wealth of practical examples using MATLAB(r) and Excel, spreadsheets are available for download from an FTP Web site to help readers apply the methods outlined in this important resource. WILLIAM F. EGAN is an instructor at Santa Clara University, California, and formerly a Principle Engineer at TRW ESD and a Senior Technologist at GTE Government Systems. He received his PhD in electrical engineering from Stanford University and is the author of two previous books related to RF technology. Getting Files From the Wiley ftp and Internet Sites. Nonlinearity in the Signal Path. Contaminating Signals in Severe Nonlinearities. Appendix A. OP AMP Noise Factor Calculations. Appendix B. Representations of Frequency Bands, if Normalization. Appendix E. Example of Frequency Conversion. Appendix F. Some Relevant Formulas. Appendix G. Types of Power Gain. Appendix H. Formulas Relating to IMs and Harmonics. Appendix I. Changing the Standard Impedance. Appendix L. Power Delivered to the Load. Appendix P. IM Products in Mixers. Appendix S. Composite S Parameters. Appendix T. Third-Order Terms at Input Frequency. Appendix V. Sensitivities and Variance of Noise Figure.